Someone trying to prove a point about the nature and value of art—or about the remarkably steady birth rate of suckers (still approximately one per minute! )—has printed out a screenshot of a 4chan post and sold it on eBay for nearly six figures. 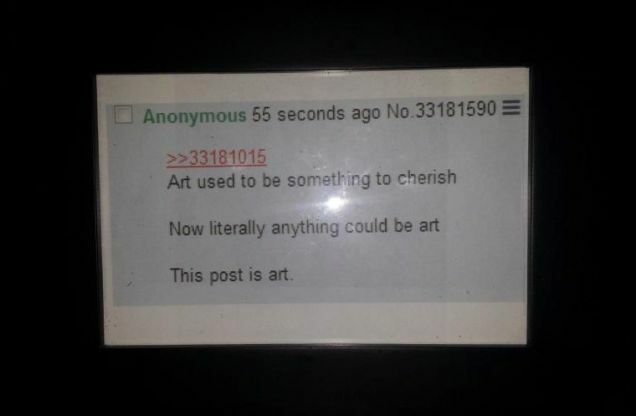 "Art used to be something to cherish / Now literally anything could be art / This post is art," reads the musing of some anonymous deep thinker from one of 4chan's messageboards. The "piece" was listed on eBay last week for $500, and reached a top bid of $90,900 by the time it closed on August 1. "This auction is for a One of a Kind work of art by Anonymous. This work is untitled. This item will be shipped in a frame for convenience. 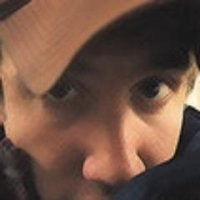 This artwork will be sold with no refunds accepted," wrote the seller, Xhacker02. As with anything 4chan related, it'd be gullible to discount the possibility that bidders were just doing it for the lulz, but the winning bidder has a long history of positive eBay feedback, so it's possible they intend to pay. Meanwhile, someone created a metacommentary on the original message by auctioning a printout of Xhackero2's eBay auction. Bidding had reached $50,100 before it was pulled. Is "Artwork By Anonymous" actually art? No. Maybe? I don't know. But that's not the point. The point is how much someone is willing to pay for it.